Introducing portable planters to a garden or previously barren area presents some exciting planting possibilities. Instant gardens can spring up in boring back yards and border hitherto dull patios. Doorways and other entrances can be enhanced with pretty potted climbers for a warm welcome. Wildlife – majoring on birds, bees, butterflies and if you’re lucky, hedgehogs – might be enticed to forage and help pollinate plants, such as small fruit trees or bushes. Planters can act as arresting focal points in a larger garden and also enable wall climbers to run wild in spots where the earth may be paved, where roots may be too undermining in nature or the local soil is not to the liking of said specimen. With a little bit of planning, seasonal container gardens can be refreshed and enjoyed year after year and if you move, can be transplanted to the new bare patch! There’s a lot of choice out there – planters, pots, troughs, barrels, boxes in various materials (terra cotta, wood, vintage lead) – but are there all weathers-proof versions, like the lovely old heritage lead planters but not as heavy and that stay smartly in shape? Nicely handmade in Britain? Strong and sturdy? Lasting a lifetime? Ta da! We’ve recently created lead-look galvanised steel garden container collections that do meet this tall order. Now that we have those to hand, we can think about where to place these beauties and what to plant in them! You can of course scatter containers around a garden to enhance what already exists but it’s also a good idea to plan planters into a garden design at the outset, keeping in mind watering regimes, sun or shade, textures, height, structure, ‘bling’ (seasonal highlights) and line of sight. Planters can punctuate views and angular paths beautifully. Place them well. What will be the end result? A temporary rooftop jungle? An interior office atrium? A garden-guarded doorway? An urban balcony allotment? A fern-filled shady hotel courtyard? A pop-up wildlife garden? A portable riot of seasonal colour for the terrace? Or something more formal, elegant and classic? Endless possibilities. Do explore some planting ideas and looks over on the Garden Requisites pinterest Metal Garden Planters board. Garden Requisites planters can be integral and complementing elements in gorgeous gardens that feature our handcrafted English wirework garden trellis, arches, gazebos and obelisks. If you’re really going to town, look to the house where planters can serve as doorway sentinels alongside elegant porch covers, planted with Box or Bay, or even climbers that reach up through porch side trellis. Small planters or troughs can also be fashioned to sit in metal window boxes. If you choose your planters well and follow some good advice on keeping your plants happy and healthy, your container gardens will be hugely rewarding. 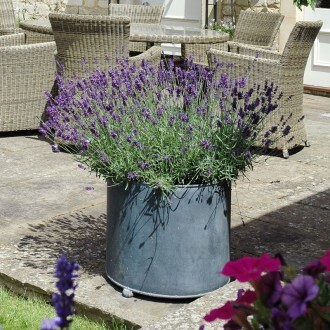 We have groups of ready-measured galvanised planters – circular, square or rectangular – in varying steps of sizes. Or you can tell us exactly what you need and we’ll ask the workshop team to forge those for you instead. Come rain or shine, your planters can be more permanent, well-loved solid garden design elements that are integral features in your formal or informal planting schemes.